Whether you are a conspiracy “factist” or not, the gaping holes in the official narrative of the attack on Charlie Hebdo must be raising questions in even the most somnambulant minds. This article is an attempt to draw your attention to these contradictions and to lay the facts on the table for your own investigation. We shall set the scene with a Google photo of the Charlie Hebdo offices. These offices had been under constant police surveillance after a series of threats against the media outlet due to their islamaphobic cartoons and hate speech. Manuel Valls had himself authorised the withdrawal of this surveillance in the summer of 2014. 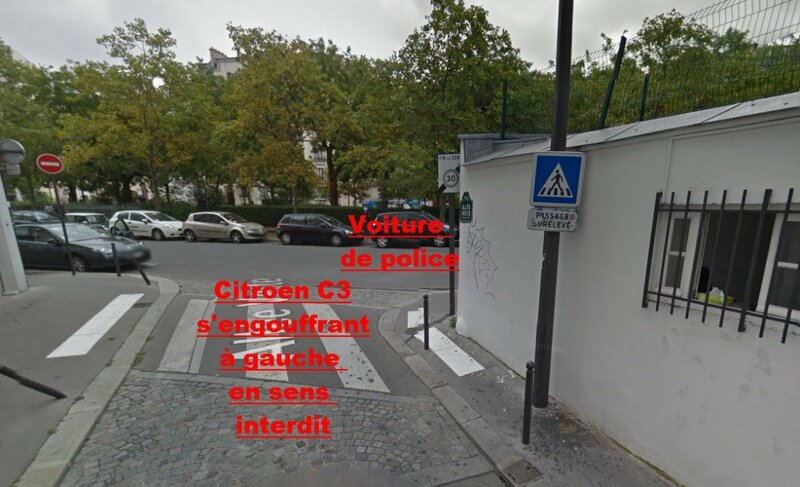 However on the morning of the attack, at 7am a police car was observed parked outside the Charlie Hebdo offices and the police inside this car were witnessed talking to a “suspicious” character at the entrance to Charlie Hebdo. 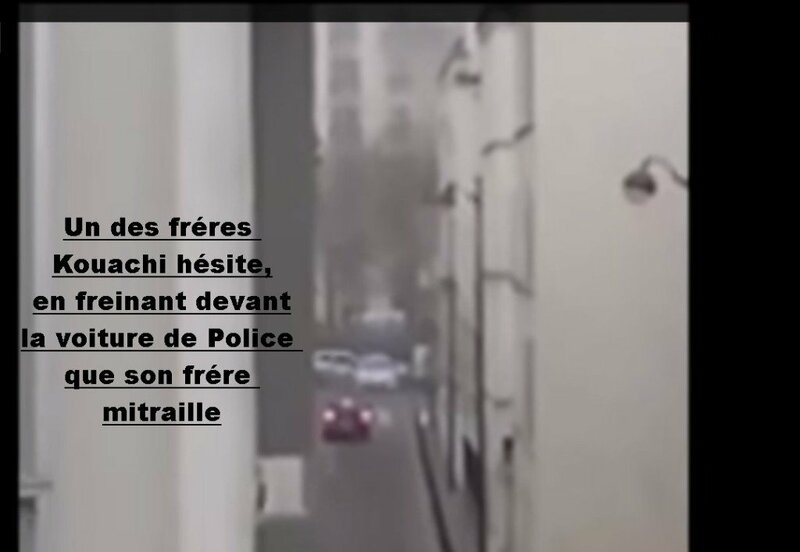 To the left of this photo we can see the Allee Verte which was the chosen escape route of the attackers. Next we ask you to watch the video of their getaway. Please bear in mind that these protagonists had just killed 11 people in broad daylight in the centre of Paris yet they take the time to stand on the corner of the street shouting their “Prophet Mohammed” and to rearrange their weapons before calmly getting into the car and driving away down the Allee Verte. When you watch this video, please pay particular attention at 1.35 – 1.39 when you will see the attackers car brake in front of the police car. The stills will also show this more clearly. We would like to draw your attention to the fact the police car blocks their exit right onto Boulevard Lenoir, forcing them to turn left against the traffic of a one way road! In this image we can clearly see the police car has pulled over to the right and is blocking the turn right. At this point it is being fired upon by the Kouachi brothers. 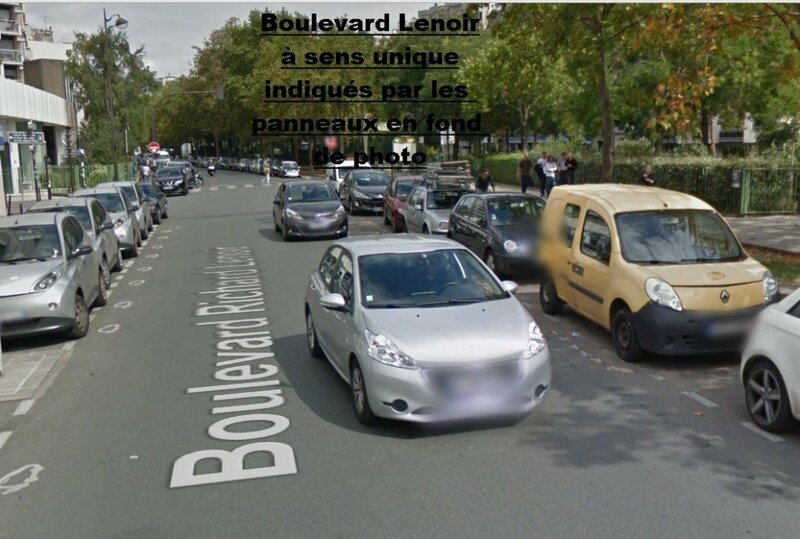 ​In this image, you clearly see the Kouachi brothers brake in front of the police car before turning left onto Bvd Lenoir..going against the traffic of a one way street. This image shows a close up view of the turn left that they attackers were forced to make. The police car is stationary on the right and is blocking their exit right. 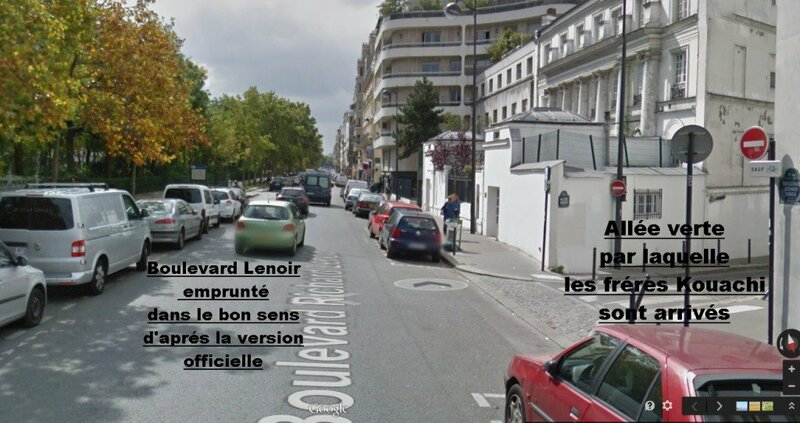 This also contradicts the Official Version that has claimed the Kouachi brothers turned right at this point and traveled in the direction of the traffic onto Bvd Lenoir. This image gives an idea of the traffic that would normally be on the Bvd Lenoir at midday in Paris. The Kouachi car turned into this traffic with a police car behind them. take place, the Kouachi brothers must have turned right…but they didnt, they turned left! 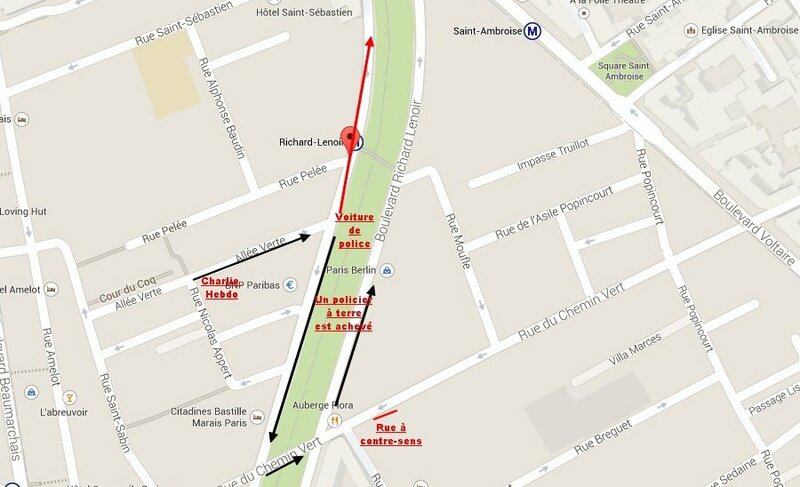 This map shows the route the Kouachi brothers took according to the official version. 1. The hooded armed attackers arrive in their car. They firstly went to no. 6 which was the wrong entrance. 3. They threaten the artist Coco, she tries to divert them to the 3rd floor before she is forced to give them the code to the security door of the editorial team offices. 6. The Kouachi brothers according to the official version turn RIGHT. On Bvd Lenoir they exchange fire with police officers. No injuries. 7. The Kouachi brothers exit the car and we see them shoot Ahmed Merabet in the head. Again for this to be possible, they must have turned RIGHT onto Bvd Lenoir. Kouachi brothers. The red arrows show the actual route taken. 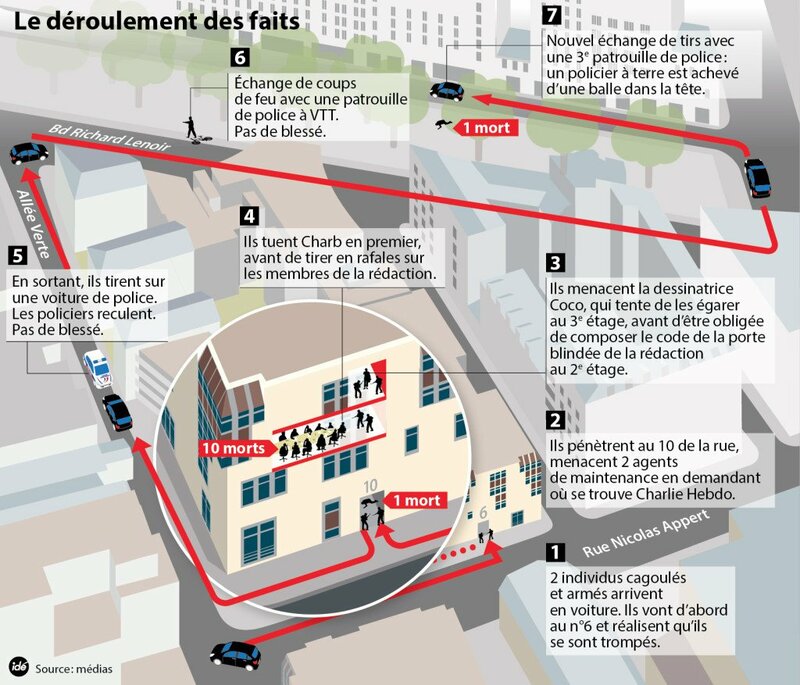 In order for the Kouachi brothers to get back onto the official trajectory they would have had to take a very convoluted route or do a three point turn in busy traffic which would take them into the path of the pursuing police teams. Hardly logical for hunted attackers who have just murdered 11 high profile media personalities. 1. How did the Kouachi brothers avoid hitting a vehicle when they were travelling against the traffic of a busy central Paris road system. 2. 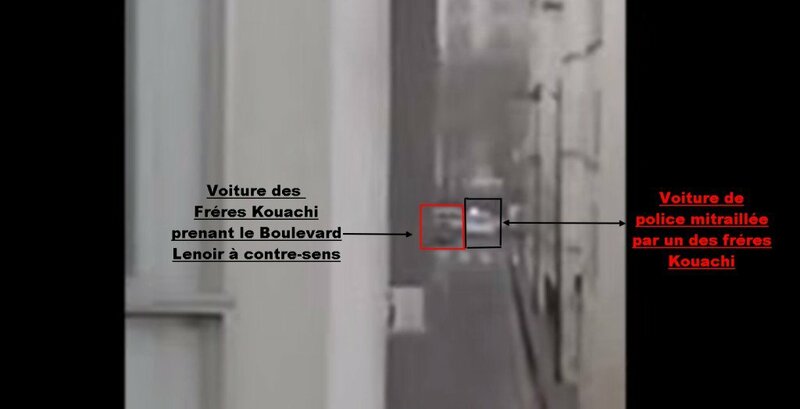 How did the Kouachi brothers miraculously turn around and avoid their police pursuers in order to make it to the spot where they killed Ahmed Merabet? 4. How did they make it safely out of Paris despite their very apparent amateurism at the wheel of their Citroen C3? 5. How on earth has the mainstream media and the investigative team adhered to such a contradictory and even erroneous narrative? 6. Where is the autopsy report on Ahmed Merabet. Were there any pictures of the body? Has anybody interviewed his family? Once again, we are not drawing any final conclusions, simply attempting to pull together the threads of this web of contradictory evidence and invention that is being presented to us by the official version. We are knocking down the house of cards to find the truth beneath.